MOBAs are still at the height of popularity, but as the past year or so have gone on, quite a few have risen and then subsequently fallen: Dawngate and DC Infinite Crisis in particular sending shockwaves with their premature closures. Trying to reinvent the wheel is a dangerous game, but has proven the path to success for other competitors like SMITE, and if hype it to be believed, Gigantic. But today we’re here today talk about Call of Champions! 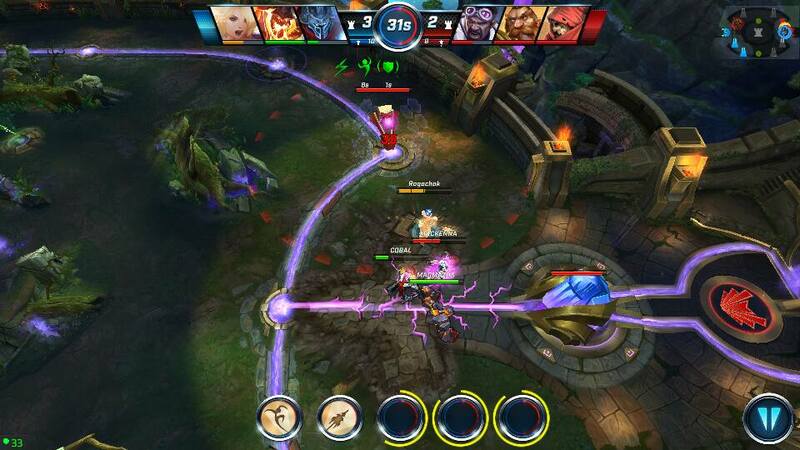 A mobile MOBA is something I was leery about, until I got a peek of it at Pax Prime. My time with it was brief, but not too long ago I got invited into the beta to take a look around, play some matches with developers, as well as some bots, to see what it was all about. 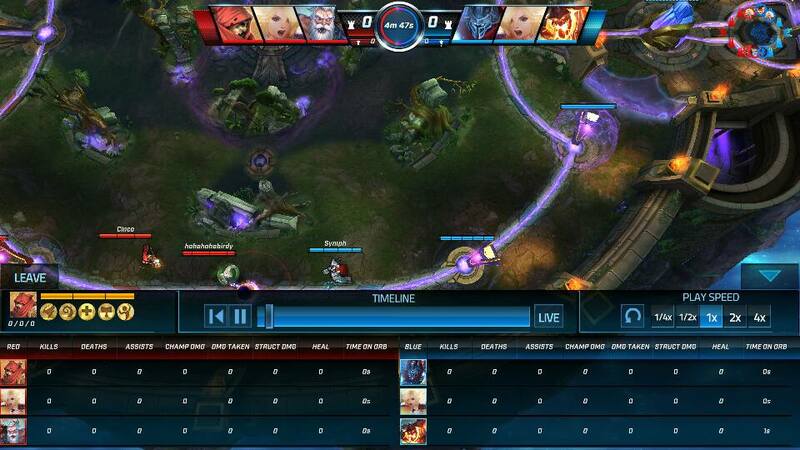 A MOBA requires communication, knowing matchups, items, creep farm, and a lot of other strategems. However, this one takes item shops away (in the vein of Heroes of the Storm), and creep farm as well. It requires a decent mobile phone (or tablet, I also play on my Galaxy Tab A), but the 3v3 works quite well for a mobile. While it may not be reinventing the wheel, it is definitely changing the road that the wheel lies upon. 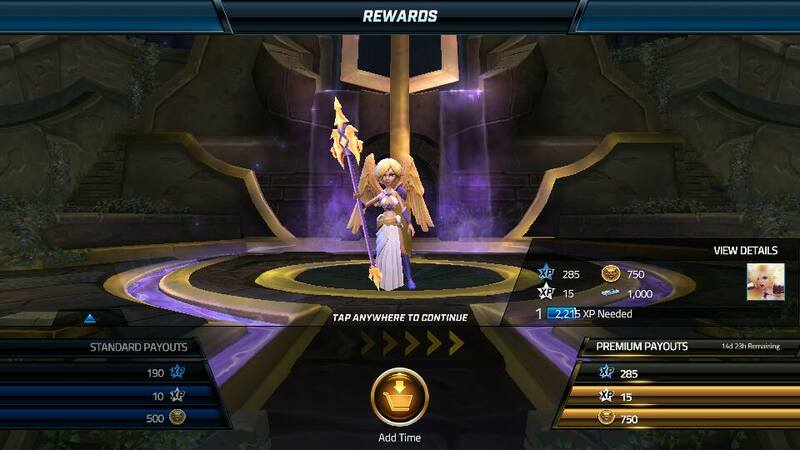 Spacetime Studios is no stranger to mobile games though, and despite a dark period of copycat titles, they are responsible for the first big 3D real-time mobile MMO in Pocket Legends. They are dedicated mobile developers with quite a few accolades under their proverbial belts. 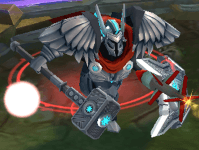 Call of Champions is fun! And that’s pretty damn important. At present there are sixteen champions, based on one of the elements, and each one plays different. 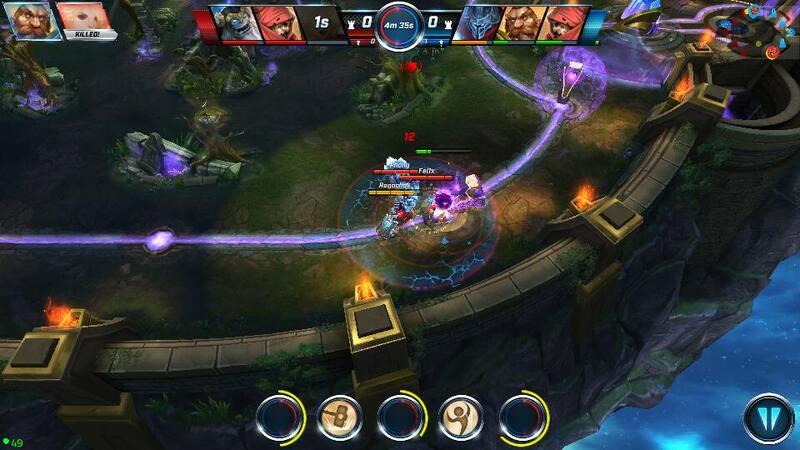 Call of Champions reminds me of some kind of intense game of tug of war. 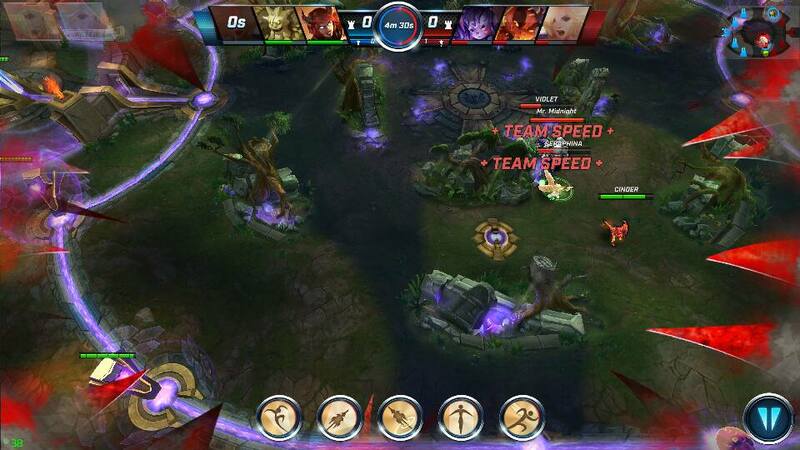 The game uses an Orb system; each team has two lanes, and between the teams is an orb in each lane. Controlling the orb pushes it ponderously forward towards the enemy tower, where it will take the shots for you so you can push it down. Having the orb present also increases the damage you deal to the tower. But the other team can come and stop it from moving forward, creating a fight for it, until one team retreats or dies where they stand. There’s also a jungle in the center of this map. On either side (top/bottom) of the jungle portion of the map there are spawn points for a variety of buffs (damage, defense, speed, etc) that you can run up and grab for yourself, but here’s the fun part. If you can make it to the middle of the jungle with the buff, and channel for a few seconds, you can grant that buff to the whole team! 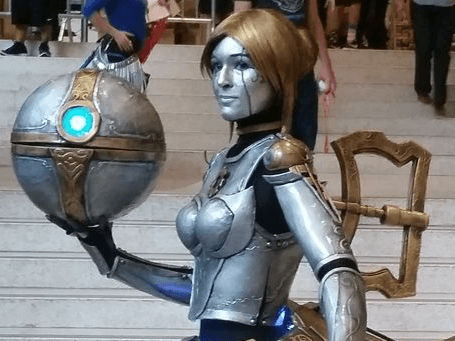 Imagine one of your assassins is moving in on an orb to push a tower, and suddenly has an attack buff; she leaps off screen, down onto the enemy carry, and obliterates them! Now the advantage goes to your team. Combat is simple enough to be easy to follow even on small screen displays. You start with all your abilities on the bottom of the screen, and tapping it shows where it will activate, tapping again in another direction will change that direction and fire away. Holding a finger on it will show what it does if you aren’t certain/didn’t check pre game. Tapping enemies causes you to auto-attack and tapping the map moves you about. It’s simple to get into but hard to master, that’s for sure! THIS IS A FIVE MINUTE GAME. Three on Three, five minute matchups. You heard that right; one of the things that many MOBA game players grow frustrated in are games that last forty, fifty, and even sixty minutes in a world where chances that one of the ten players has a not very understanding mother that needs the trash taken out now, not later. Sure the rare occasion where everyone is in it for the long haul can be exciting, but in today’s world us aging gamers ain’t got time for that. But you can pick up Call of Champions virtually any time, have a couple of matches, and get right back to your personal life! So you’re probably asking the same question I was: How does a five minute match even work? Can you push into their base and win in five minutes? With a good team comp and a strong offense/defense, absolutely. But if you don’t, fear not. Victory comes down to Actual Victory, Most Towers, and finally Most Kills. Some of the queues in the beta were kind of long, but that won’t be an issue at launch. You can chat in game, and since it’s a mobile, if you really wanted could Skype, call, or do whatever with close friends. As you play the game, you build exp for characters you use. As their personal level grows, there are unique traits you can pick up for the characters you play the most frequently, building them in your image. It kind of reminds me of HOTS again, but it’s out of match, not inside. 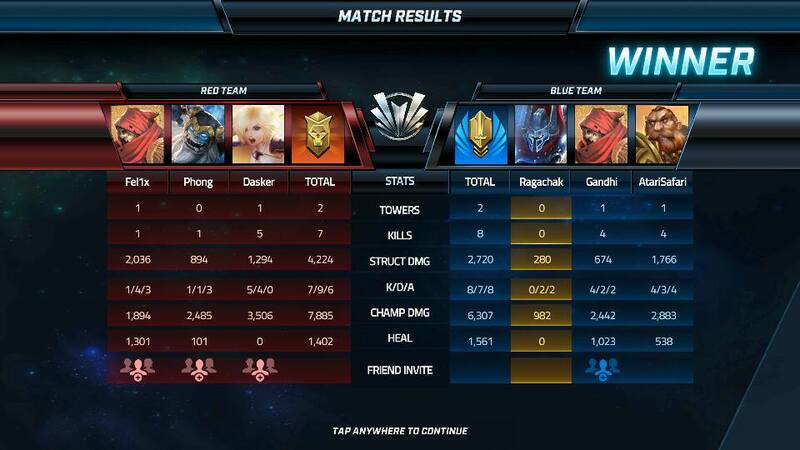 This is a free game, like many MOBAS, but there is also a “Premium” service that gives more exp, et cetera as you play. This can make your time in the game go faster, but it in no way makes you have a huge advantage over players that choose to not utilize it. The exp boost from it is pretty nice, especially if you’re impatient and want to see how a variety of the characters can play with unlocks. But when you can grind out matches every five minutes (plus queue time), the progression feels far faster and real than your typical MOBA experience anyway. To my surprise, this system doesn’t trivialize the victory or loss in the process. Instead, I feel like the adrenaline was pumping even harder, with such a short timer on the clock. Every move counts, every decision is important. I have noticed that once you have a nice, decisive lead it can be very hard to come back, even if it’s just one or two kills separating you from victory and that will no doubt be frustrating to competitive people. But luckily, it’s only a few minutes til the next match. It’s a game of adapting and overcoming. 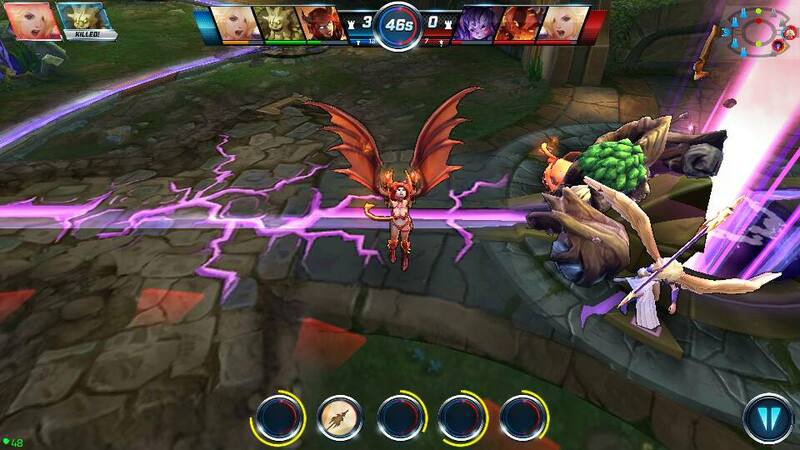 Coming soon: Call of Champions, looking to shake up how you play MOBAS!